In a large pan, add the chicken, ginger and garlic. Separate and brown the chicken until cooked through. Mix in the cabbage, carrots and green onion. Stir and cook for 5 minutes and remove from the heat. In a small bowl mix together the flour and water to create a paste for sealing the egg rolls. Take one egg roll wrapper and lay it with one corner pointing at you. Place about ¼ c of the chicken mix in the centre of the wrapper. Fold up the bottom corner, then fold the two edges to the centre. Brush a bit of the flour paste on the top corner to seal the egg roll and roll closed. Repeat process until all egg rolls are wrapped. 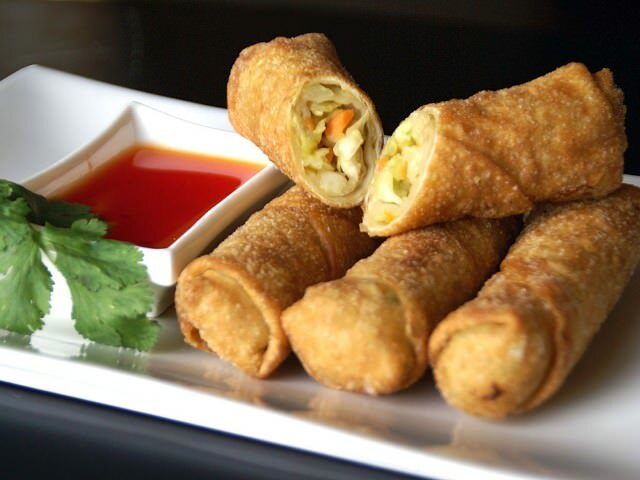 Fry off the egg rolls in a large skillet or fryer.